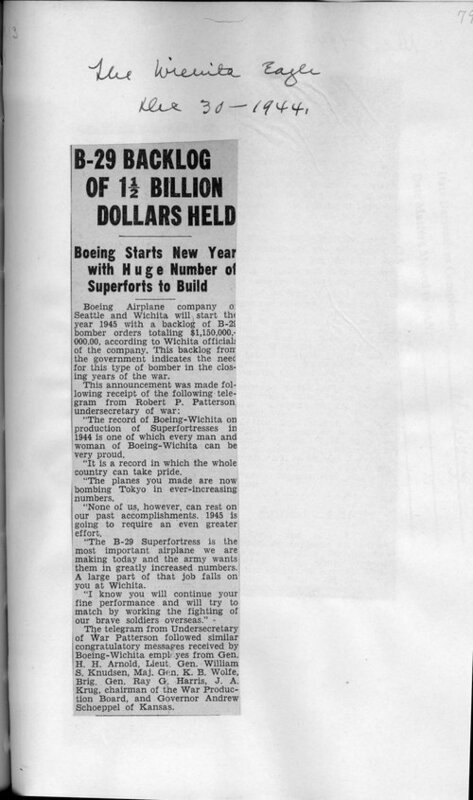 This article from the Wichita Eagle details the huge demands placed on the Boeing Aircraft Company by the War Department which needed more B-29s for the U.S. air effort in World War II. Totaling over $1,150,000,000.00 in new orders, the War Department's requirements led Boeing employees to work around the clock to produce the requisite number of aircraft. This article can be used in conjunction with other material on Boeing to help students appreciate how important Boeing was to the success of the U.S. war effort in World War II.